I love reading children's fiction. It's usually so creative, imaginative, and fantastic, with excellent morals and teachings. I like exploring kid's books for myself, but also imagining what a younger mind could take away from them. Although I don't do it often, I quite like to delve into a little fairy tale such as this one to keep me in touch with the better, more magical world of children's fiction. This story is incredibly random. So random, in fact, I was surprised when the finale turned out to be something other than 'and then he woke up'. 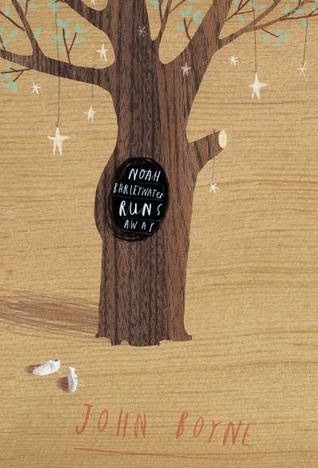 There wasn't any explanation as to why, when Noah ventured only a little away from home, he ran into talking animals, trees who cried when you pick their apples, or furniture with personalities. I'm not stupid - I need to hear why things are like this; kids are exactly the same. Although it isn't a sad story, Noah's reasoning for running away from home really tugs at the heartstrings once we work out the reasons why. At the beginning of the novel he refuses to even think about it, meaning the reader is kept entirely in the dark, however he can't keep his thoughts hidden for long. The story comes with a good message about running away from our problems, and regrets that could come from doing this. Not only this, but Boyne also lightly touches on bullying, aging, being careful what you wish for, and the importance of family. This seems like a lot for a kid's novel, but Boyne deals with each message sensitively, almost subliminally conditioning the mind of the reader. I can't say I liked this book, and I can't say I didn't like it. It would work best read aloud to children, with the reader providing extra commentary to make it exciting. I felt that the bizarre in the novel was all that was keeping my attention - although the message was deep, there was no real plot to hook a reader. A real shame. I had exactly the same love-hate relationship with The Boy in the Striped Pyjamas, and now I'm not so impressed by this one; it seems my John Boyne explorations are over.